AUBURN HILLS, Mich., Nov. 9, 2018 /PRNewswire/ — The Fiat 124 Spider Abarth takes a starring role alongside Sting & Shaggy in the official music video for their new track, “Gotta Get Back My Baby” – the latest single, co-produced by Teflon (Wyclef Jean, Fat Joe, Ruff Ryders) and Martin Kierszenbaum (Sting, Mylène Farmer, Lady Gaga), off their album, 44/876, which has spent 17 weeks atop the Billboard Reggae chart. The official YouTube music video, which amassed over 2.3 million views in just a few days, was filmed in the vein of ’80s and ’90s buddy cop television series and movies including “Miami Vice” and “Bad Boys,” and was directed by Michael Garcia. 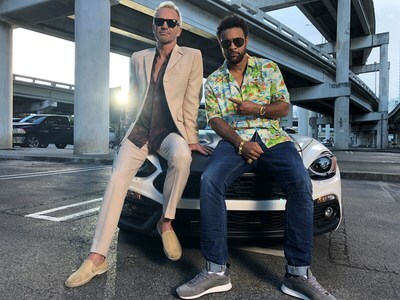 The video pairs Sting and Shaggy as two Miami detectives who convince their Captain that they’re “going to need the Spider” – meaning his prized Fiat 124 Spider Abarth – as part of their South Beach stake-out for “the most dangerous woman in the country.” What could go wrong?! The FIAT brand is also supporting the video globally across its digital and social channels, including in the U.S on Instagram, Twitter, Facebook and YouTube. Sting & Shaggy have extended their collaboration to the road for a lauded world tour, combining their respective bands to perform their greatest hits as well as new songs off 44/876, together. More information on their critically acclaimed 44/876 World Tour can be found here. Multi Grammy award winning artist Shaggy is by all accounts the true definition of a renaissance man, beyond his continued success in reggae/dancehall music and its’ influence on pop music worldwide, Shaggy is a fierce businessman, and humble philanthropist. The Jamaican-born American reggae fusion singer is best known for his singles “Boobmastic”, “It Wasn’t Me” & “Angel”. Shaggy has released numerous albums including the Grammy winning, Platinum selling “Boombastic”(1995) & the Diamond selling “Hot Shot”(2000), as well as topping an impressive chart list that includes the Top 40 Rhythmic charts, Hot 100, Billboard 200, among others. Shaggy’s illustrious career has seen the international superstar perform alongside some of the biggest names in all genres of music. In North America, the Fiat 500 was introduced in March 2011 and was soon followed by the Fiat 500c (Cabrio), the high-performance Fiat 500 Abarth and Abarth Cabrio, the fully electric Fiat 500e, the five-passenger Fiat 500L and the all-wheel-drive 500X crossover. The FIAT brand continues to expand with the introduction of the Fiat 124 Spider, a revival of the iconic roadster that combines Italian style, performance and engaging driving dynamics.